The perfect place to be when you need a good dose of Vitamin SEA! This cozy beach home provides the perfect 2 bedroom and 2 bathroom space to stay in paradise. The water front location is ideal for boaters, fishing lovers, and vacationers that want to enjoy the outstanding view from sunrise to sunset. 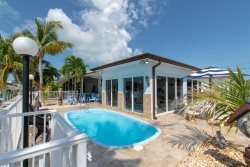 This duplex is within walking distance to the Cabana Club where you can enjoy a large pool, bar and other great amenities. Sunset Park is also tucked away in Key Colony Beach and very close to this duplex. The small beach is a great place to get another dose of Vitamin SEA! Wonderful family vacation and cant wait to do it again. Excellent experience and staff!